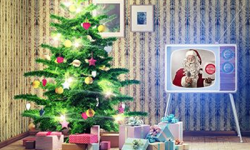 The Christmas season is known for bringing happy, joyous, and above all else heart-warming advertisements, the kind you actually like watching because they make you feel good. But not everyone gets it right. Some are bad, cringeworthy, downright shocking, and even confusing. Luckily, though, these ads are also typically something else: highly entertaining for all the wrong reasons. One word perfectly sums up this ad from Paris: what?! 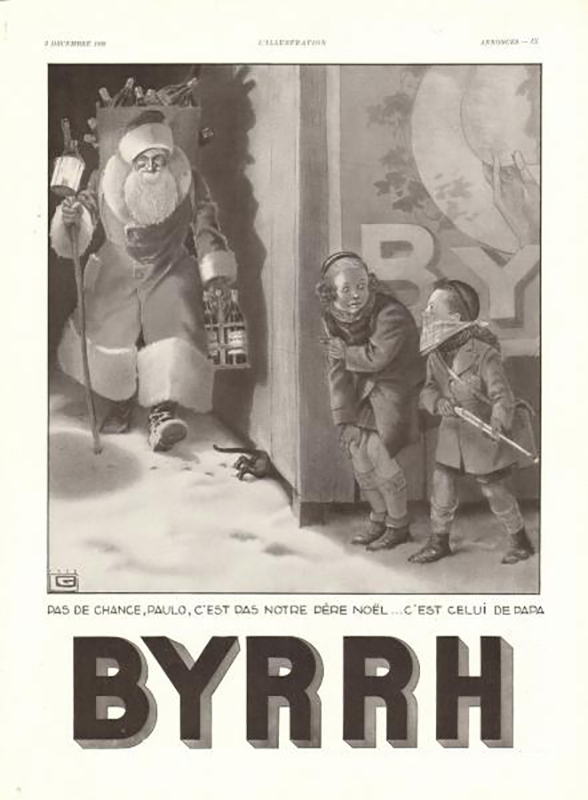 Paris was definitely trying to get a reaction with this Santa-spoof ad, however, exactly what they were going for is completely lost to us. We get it, they want you to think you’ll be cool if you wear their belt. 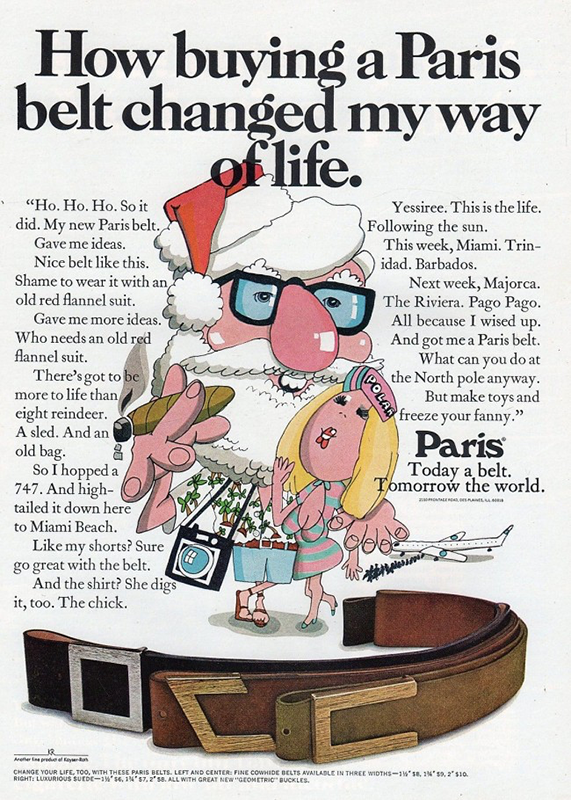 But...it’s a belt. 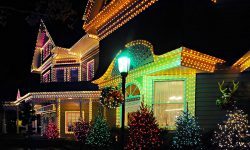 We just have one question: Where’s Mrs. Claus? 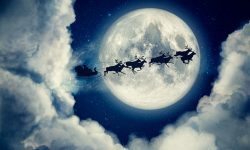 We’re not sure what is worse: the fact that Santa seems to be giving wine to all the good boys and girls this year (did you see the sack he’s carrying?) 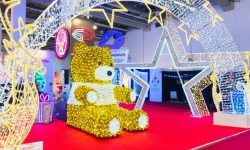 or the fact that two little bandit kids–one with something that looks like a B-B gun–appear to be ready to rob Santa as soon as he turns the corner. PETA is known for its “shock-and-awe” advertising, but this one just seems in bad taste. 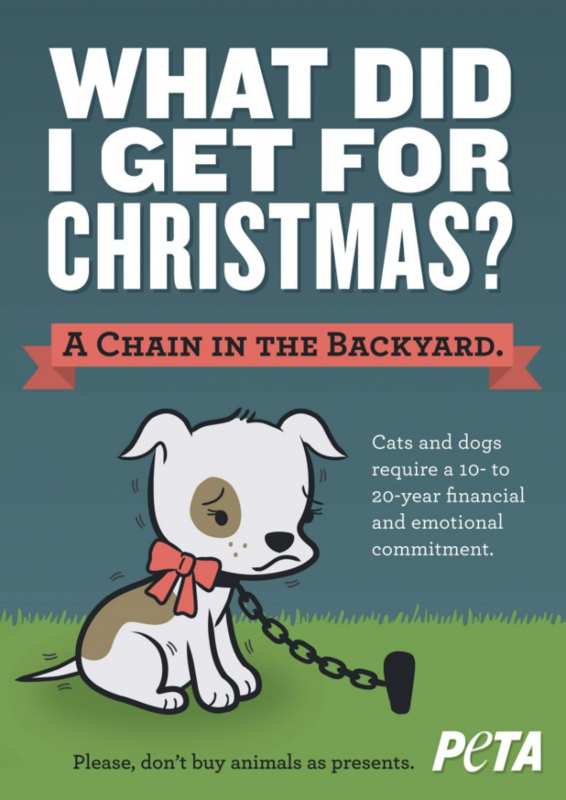 We get it, but does everyone that receives a pet for a gift during the holidays chain them up in the backyard? Even a majority? Should a stray cat or dog not be saved from the pound? Whatever your take on the matter, something tells us PETA didn’t think this one through. 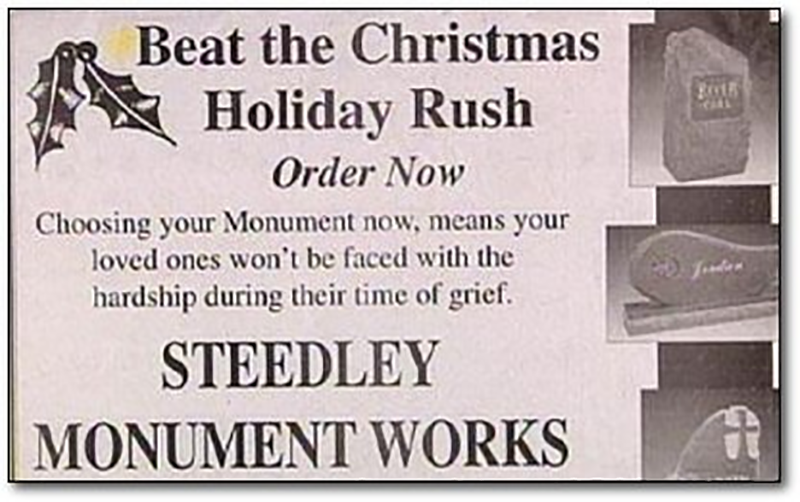 As cringeworthy as this is, we suppose Steedley needed to advertise like any other business at the time. 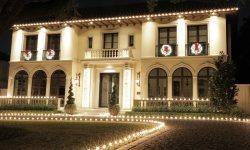 But, “Beat the Christmas Holiday Rush”, during a time of year where death tolls are at their highest just seems...in bad taste. 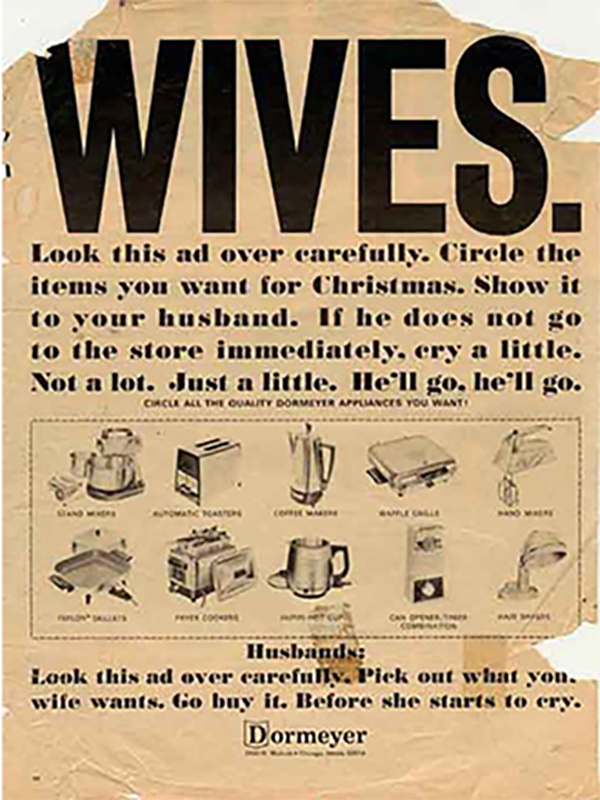 Nothing screams 1930’s advertising like sexism and home appliances. This Dormeyer ad is a perfect example of the way cultural acceptance can shift dramatically over time. You know you’re in for trouble when the first third of the page has “WIVES.” listed in all caps and extra large font. And it doesn’t disappoint. 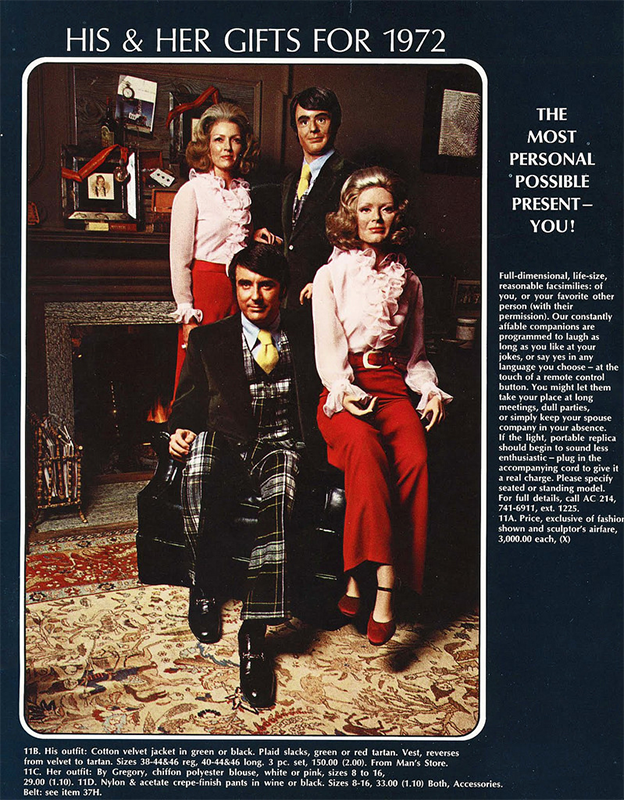 Easily the creepiest ad on this list, we’re not exactly sure what the unknown makers of these life-like mannequins were thinking when they marketed it as a great holiday gift in 1972. A copy of myself that can sit through long meetings and dull parties? Sign me up! Truth be told, when this ad ran in 1936 cigarettes were much more widely accepted due to the lack of widespread knowledge of the dangers of nicotine. However, looking back on this now it just leaves a bad taste in our mouth (pun intended). Is that a laser? Radio wave zapper-thingy? Alien blaster? No, seriously, we can’t tell. 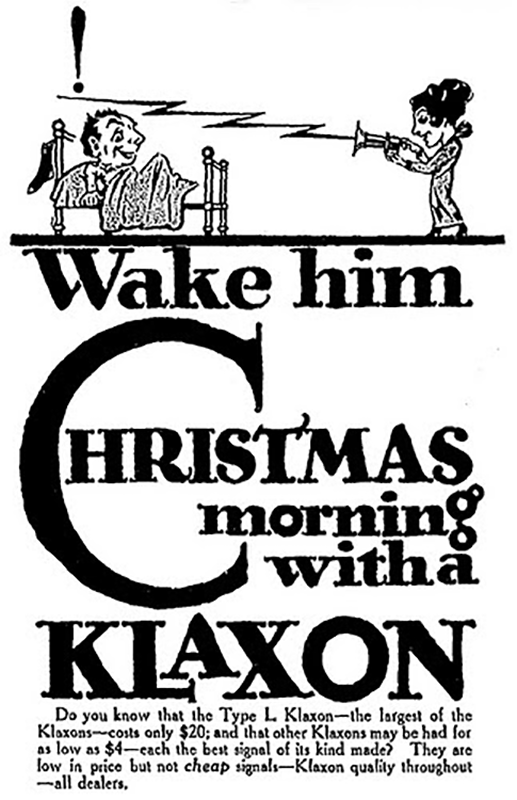 Apparently this ad from Klaxon is for their Type L Klaxon blow horn. It’s hard to tell by his face, but it either did the trick to wake up old Mr. Wilson there and he’s nice and spritely or he’s filled with a fit of rage and is about to do something he’ll regret. Either way, good prank Mrs. Wilson. 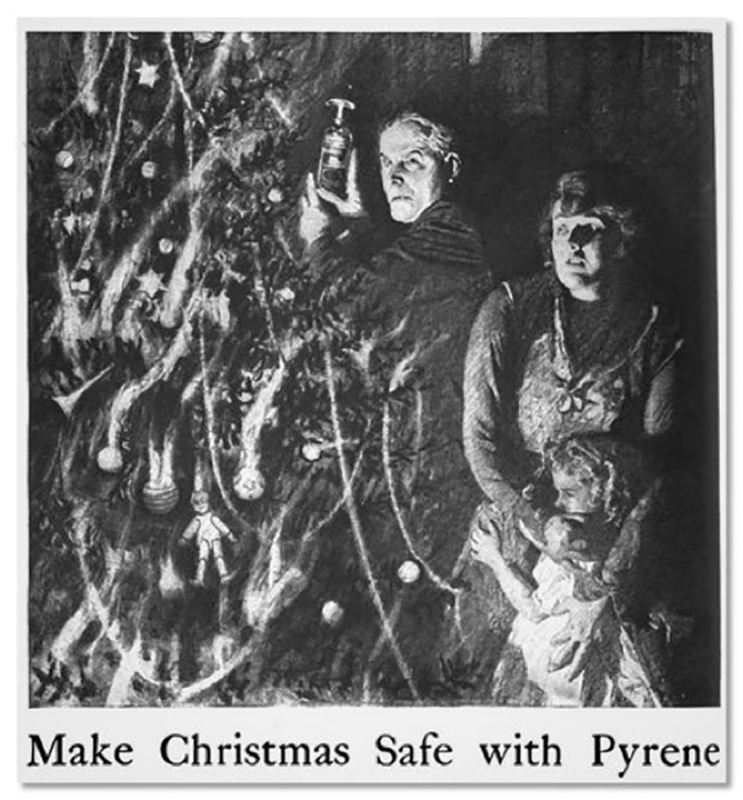 Pyrene clearly knows how to make a strong impression as seen by this Christmas ad they ran for their brass pump fire extinguisher. The sheer terror in the face of each family member appears so realistic you almost feel a bit of fear for them yourself, instantly wiping all sense of holiday joy and cheer from our hearts. However, no one can question the ad must have been effective at selling extinguishers! We think? 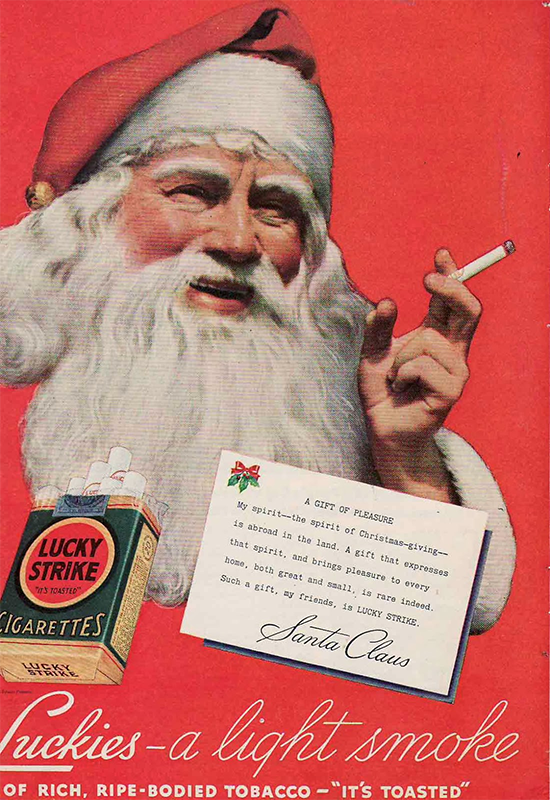 So, what’s your favorite bad Christmas ad? 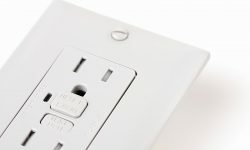 Have one we didn’t mention here? Tell us about it in the comments below.